"Everyone was amazed with your ability to make people belly laugh! Thank you for helping make our day stress free." You’ve booked the perfect venue, found a fabulous dress and maybe even found someone you’re happy to spend the rest of your life with! All that’s left to worry about now is your wedding guests. After all, you want them to have an amazing time on YOUR wedding day, but you don’t want to be the one frantically running around, making sure everyone is happy, laughing and having fun. “JANICE!!!! Get over here quick! Uncle Dave’s started telling that story about the man from Nantucket…”. I'll entertain your guests, so you can enjoy your wedding day! I know that you’ve probably still got a few questions though, so I’ll try to answer them as best I can. Better yet, why don’t I let past brides and grooms answer for me? "Do I really need a PROFESSIONAL wedding magician? Can't I just find someone who knows a few tricks?" I’ll be honest, the tricks are only a small part of what makes a wedding magician a great addition to your special day. We’re not just doing tricks. We’re making people laugh. We’re interacting with everyone, of all ages. We’re skilfully looking for potential problem areas with your guests. We find the one person on their own, nervous about making new friends and we bring them into the group without it being too formal or scary. 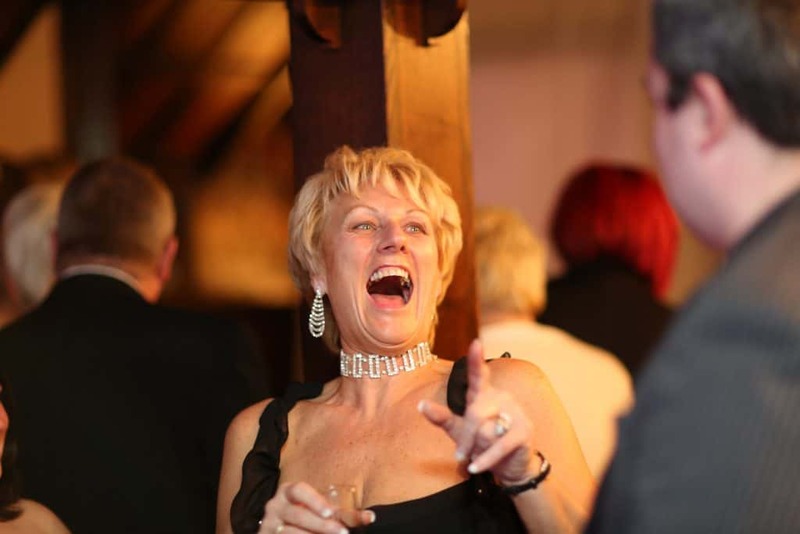 We fearlessly break the ice and make friends with all of your friends and family, bringing them together, creating a great atmosphere that makes your wedding day fabulous. Aside from that, there’s also the “boring” stuff that goes along with booking a ‘professional’ magician – the paperwork, contracts, invoices and insurance – the stuff that gives you peace of mind from knowing you’ve booked a professional wedding magician. Do you really want to trust all of this to someone who knows a few tricks? I don't want to chance it with an amateur. I deserve a PROFESSIONAL wedding magician! "How do I know you'll turn up? My friend booked a wedding magician and he "suddenly" realised he was double booked the day before the wedding and he magically vanished!" Unfortunately, I’m seeing this a lot. 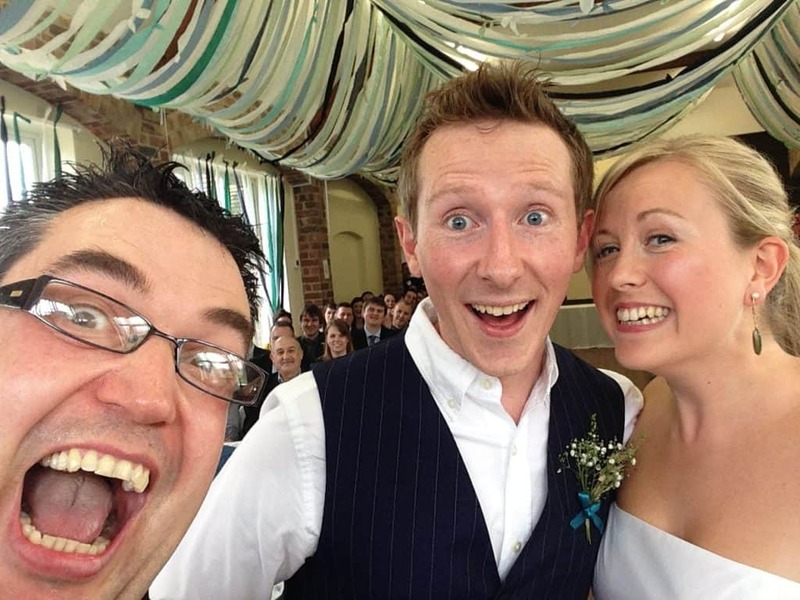 Happy couples are amazed when they manage to book a wedding magician at a bargain price. It seems too good to be true (you can see where this is going, can’t you?). A wedding magician who takes a booking without a contract or deposit should be avoided at all costs. If you take nothing away from this website other than that, I’d be happy, (though admittedly, I’d be a little disappointed). Without a contract or deposit, the wedding magician is free to take a better gig should it come in (and when I say “better”, I do of course mean “higher paying”). That’s why they can offer a cheaper price. ALWAYS GET LEGAL AGREEMENTS IN PLACE WHEN BOOKING WEDDING SUPPLIERS! This is YOUR wedding day, so get the assurances that you need. I want to enjoy my wedding planning. How can I book you NOW? "A few of our guests have got kids. Can you entertain them too?" When you’re booking a wedding magician or entertainer, you want to make sure you book one who can entertain everyone – not just the cool crowd in the corner. I’m the resident magician at Everton FC and St Helen’s Rugby League – I worked the hospitality areas of both clubs – for FAMILY AUDIENCES – at EVERY home game and have done for years. I’m more than happy entertaining people, no matter how old, or young they are! I want ALL of my guests to have a fabulous day at my wedding. Show me how! "My Uncle Alan is a "bit of a character" and gets a bit loud, rude and sweary when he's had a few...can you deal with people like that?" We all have an Uncle Alan – that one guest who we’re ALWAYS apologising for – the one that’s a “bit of a card”. I’m not the kind of magician that wants your guests to sit on their hands quietly while I’m performing. I want some interaction – some banter. Mickey taking is all good, and very welcome. I’m a comedian – I can take it. "I'd love the idea of having a wedding magician, but how can you help me have a fabulous wedding day?" If you’ve never booked a wedding magician before, it can be difficult to know how I can best help you have an amazing wedding day. The first thing I always recommend is for you to sit down and think about which parts of the day YOU’RE stressing and worried about – don’t think about how other people used wedding magicians, or what you’ve heard. What parts of YOUR day are you worried about your guests becoming restless at? Those are a great time to book a wedding magician! 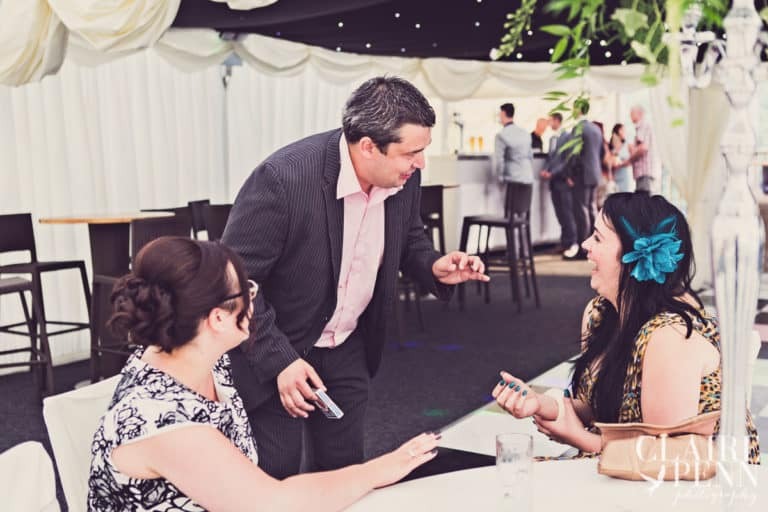 Having said that, the most popular times to book a wedding magician are while you’re taking the photos after the ceremony, as you’ll definitely want to relax and enjoy this time after the ceremony. The next most popular time is after the wedding breakfast, to keep the guests’ energy levels up as they wait to strut their funky stuff on the dancefloor! “John was a great addition to our wedding reception. Not only were they in awe of his tricks, but also were humoured by his friendly personality and the way he is able to keep his audience. All our guests commented on how great he was and some even asked if he was coming back later! "I've heard enough. You sounds perfect. I want to book you - what do you need from me?" Booking me is super simple. Just fill in the enquiry form, or click the blue button below. Tell me all the details and I’ll complete the paperwork and invoices for you to agree (this is all done securely via email, so you don’t even need to brave the queue at the Post Office!). I take an initial payment of £100 to secure the date and, once that’s paid – we’re all set!